The cardiovascular, aerobic spinning exercise burns fat the moment you get started. Hooping tones your abs and strengthens your core muscles, like midriff, buttocks and stomach muscles in particular. Hooping lifts up your spirits, opens your heart and works your brain. It relieves you from stress and tackles functions of both your brain halves by its challenging diversity. Magnets make the difference. Discover the extraordinary healing and soothing power of magnets. The hoop generates a magnetic field while you work out boosting your immune system and resulting in a chain reaction of benefits that will spread from head to toe. Hooping infuses traditional Tai-Chi, Pilates and Yoga benefits. It energizes you with various fitness movements: From Street Dance and Hip Hop Moves to Salsa. Swing up your life and find power, flexibility, endurance and dynamics. Action Hoop is collapsible into 8 parts by a one-click-spring lock system. For assembly connect the spring locks to their respective loops. Press on the hoop joints until you hear an audible „click“. Before spinning put some stress on the hoop joints to make sure they are properly connected. Beginners should not exceed 5 minutes workout time per day. Get used to your hooping workout gradually. Learn spinning at your own pace. Do not attempt to hoop while pregnant, when you are carrying electronical implants, suffer from high blood pressure or when your health is weak or already at risk. Make sure you keep a proper distance to objects and other people near you while hooping. Use the hoop only for exercise purposes according instructions. In the beginning soreness and bruising may temporarily occur. This side effect is not unusual or harmful. 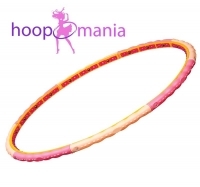 You can prevent bruising simply by wearing the Hoopomania elastic exercise belt.